R2T58LW-19-UFL Roo2 4.940GHz to 5.850GHz 19dBi Waterproof Compartment Antenna, White low profile. 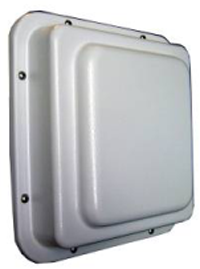 The RooTenna® 2 panel antenna offered by Pacific Wireless was developed to allow integration of the customers’ radio equipment inside the weatherproof compartment. The expanded radio compartment is big enough to house transceivers, amplifiers, and other electronic equipment. This Low Profile RooTenna® holds electronics up to 9x7x1.375 inches with the mounting plate installed or 1.5625 inches deep with the mounting plate removed. The antenna design utilizes a wideband element array over a solid 8.5” square backplane for consistent performance over a wide bandwidth. The housing is white UV stabilized ABS plastic. The backplate is alodine coated aluminum with stainless steel fasteners. All bracket fasteners are stainless steel for corrosion protection. There are qty 4 8-32 threaded standoffs provided inside the enclosure for customer mounting. Included with the Roo2 are a customer mounting plate and the RJ45-ECS ethernet connector system. R2T58W-19 Roo2 5GHz 19dBi Waterproof Compartment Antenna. White, regular profile. R2T24W-15 Roo2 2.4GHz 15dBi Waterproof Compartment Antenna, White, regular profile. R2T24-19 Roo2 2.4GHz 19dBi Waterproof Compartment Antenna, White, low profile.